Krishna’s form is spiritual; it is not made of matter. 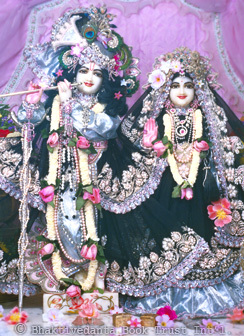 In our present condition, with our material eyes, we cannot see Krishna. So He descends in an apparently material form as the deity in the temple to allow us to see Him and serve Him directly. For God there is no difference between material and spiritual energies, since they both come from Him and are under His control. He can use them as He sees fit. By Krishna’s will, the apparently material form of the deity is actually spiritual. In the Vedas, Krishna reveals how the deity is to be made and worshiped. When Krishna’s form is created in this authorized way, He is personally present to accept service from His devotees.